Ohmigod, it's the first blog post in almost three months. 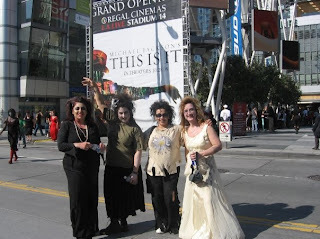 On Saturday, October 24, 2009, at 5:30 pacific standard time, I took part in the Thrill The World event, an annual worldwide simultaneous dance of Michael Jackson's Thriller. 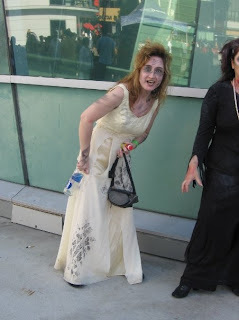 Zombies from all over the world participated! PEI (Prince Edward Island, where the character of Anne of Green Gables lives), Australia, Germany, France ... and of course, Los Angeles, California. I was at L.A. Live by the Staples Center. So were about 4000 other people. It was in the mid-80s, and my makeup kept running. But so did everyone's, so I guess that's okay. I left the house looking like a bridesmaid who'd gotten run over by a car. I had the tire tracks and the torn dress to prove it, see? I refused to wear the fake blood (which came in a ketchup-shaped bottle) because it gave my tummy the willies. My fatal injuries were internal. We did a warm up practice once. Then again. And again. Maybe even again after that, I don't know. And then the time was upon us. We were going to do the Zombie March for real, at the same time countless other people across the world were doing, too! We were Booty Swimming in Canada, Hip-n-Roaring in Hawaii, Sliding in Wisconsin and doing the Wuz Up in Seattle. The hardest part? Lying on the ground in 80-degree weather. You can catch a wee glimpse at me at .58. I'm in yellow and usually facing the wrong direction. I think I'll do it again next year.